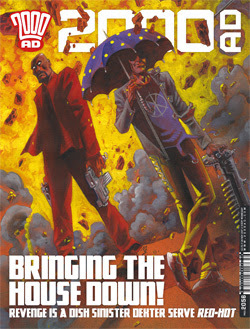 My thoughts on this weeks Prog of 2000 AD! The Black Snow story continues and we get a good look at the raiders and what they stand for! Is it money or vengeance though? the arrival of the Mega City One Judges makes an interesting point, as does the reaction of the bureaucrats in East Meg Two! I’m pretty sure these things are all linked, so I wonder where it will all go! We get a look into Slaine’s family in this issue, but how much can we trust it after the reveal of last issue? Nevertheless, it’s an interesting story, and I like the art with some big battle panels with plenty of gore! Slaine’s convincing of Sinead was very well done as you see the realisation of her role! The final plays make their way towards the end. I like the escape via stories method and it all makes sense in a weird way. I liked the art style of it all – it looks like people are making their motives known! This arc concludes in a clever way. I like the compination of the humour and the action in it. I liked the method of it all and the ending fits in really well! A nice split story here, with Absalom getting some answers – even to some he didn’t know the questions to. He also seems to have found some help in the quest to rescue his grandchildren. Meanwhile, his partners are on a car chase from hell, which is pretty much devoid of speaking, but tells a lot nevertheless!